Technical skill training can be conducted for outdoor enthusiasts, developing outdoor instructors or anyone who is interested in learning about outdoor activities. 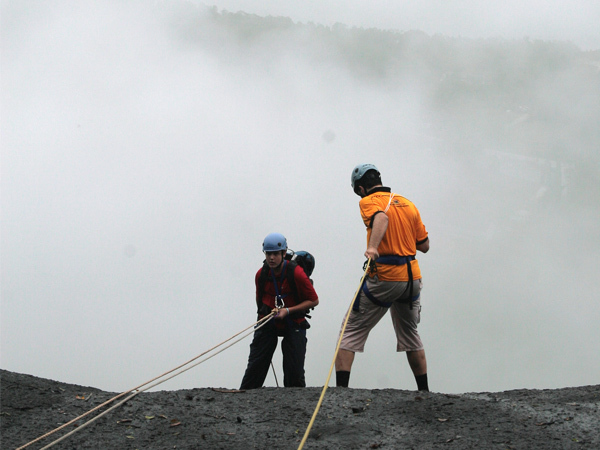 At Wilderness Malaysia we are passionate about education and training. Our aim is to create in others a deep desire to learn and to spark a curiosity within which will see participants eager to improve and develop their own skills well after the course has ended. We believe in a holistic approach to learning which focuses on each learner as an individual. We are aware that people come from all different backgrounds and learn in a variety of different ways so our training methods cater specifically to individual learning needs. One of the key components of effective training is whether or not the participants are engaged. At Wilderness Malaysia the way that wedeliver our courses ensures that we get the participant's attention at the very start and maintain this interest throughout. By using a variety of teaching tools such as power point presentations, DVD's, worksheets, practical activities, games and visual aids we are able to continually motivate and stimulate our audience. By creating a safe learning environment, participants are made to feel comfortable and continually encouraged to express themselves, challenge ideas presented and ask questions. Learners are given the support needed to try new things and break through the boundaries that may have limited their performance in the past. Our facilitators teach for real understanding rather than simply passing on knowledge. 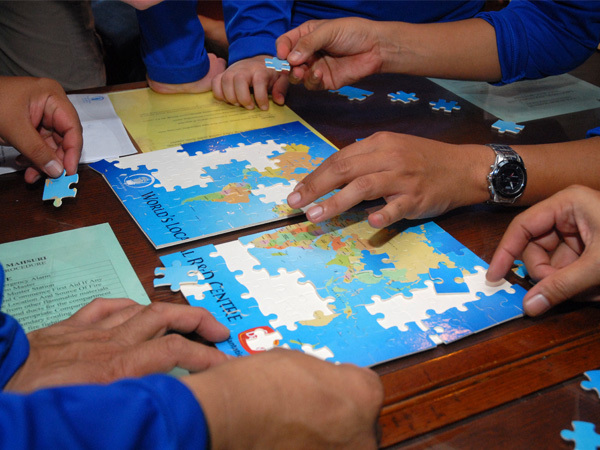 Experiential learning activities and questioning techniques ensure that participants are encouraged to think outside the box, learn from their mistakes and challenge themselves on a broader intellectual level. All the training programs conducted by Wilderness Malaysia are eligible to be claimed under the HRDF levy, subject to prior application to HRDF by the employers/companies. As a HRDF certified training provider you can be assured that the courses we offer are conducted at a professional and international standard. At 68 meters in length, S.T.S. PUTERI MAHSURI is Halim Mazmin Group’s own Tall Ship, a 3 - masted barque and the only one of its kind in these waters. WM uses sail training vessels as a platform for experience-based learning and personal development, community spirit and environmental awareness. We can provide a wide range of voyages to suit all ages and interests. Voyages can be from a 3 hour sail or as long as 12 days in length. Our programs focus on personal growth and development through personal challenges and experiential learning. The voyages are not about learning to sail a tall ship - it’s about self exploration, friendships, community spirit, teamwork, self reliance, environmental awareness and much more! All the programs are operated under the principle of ‘challenge by choice’. The demanding classroom and shipboard environment would involve participants learning rigorous skills and return home anchored in experiences of self-reliance and teamwork. Often included in our programs are shore expeditions to remote islands & beaches. Sail Training is also a great corporate team-building program. This 2 day course is an introduction to water safety ideal for those people who do not yet have the swimming ability or the need to complete an LSSM bronze medallion award. The course aims to improve participant's safety awareness and confidence in various environmental contexts and is therefore a must for parents, teachers, hotel and resort staff as well as adventure tourism operators..in fact anyone who is around water. The practical based course covers the importance of prevention as well as teaching basic methods for water survival. Participants will also learn and practice various rescue principles and techniques. The course is best completed in a pool environment but can also include a beach setting. The Star 1 award is an introduction to Sea Kayaking. It is a practical course which gives participants the basic skills required to sea kayak in warm sheltered waters. Throughout this course you will learn personal paddling techniques, on water communication skills as well as being given a basic understanding of the key safety considerations which need to be taken into account when sea kayaking. Our highly skilled instructors will give you personal coaching and feedback to help you improve your stroke technique. This 2 day course is a nationally recognized skill award authorized by the Malaysian Canoe Association which includes both theory and practical assessment. On successful completion of the award you will be given a Certificate from the Malaysian Canoe Association stating your competency at star 1 level. a pool environment. The 4 days can be split up over several weekends if required. This course is an intensive 10 day first aid course which focuses on extended patient care in remote or wilderness environments. It is ideal for those working within the outdoor industry or those who may find them selves in situations where medical attention maybe be hours away. Both theory and practical sessions are an integral part of the course with participants required to pass an exam and practical assessment. Throughout the program participants will be involved in many practical scenarios and given ample opportunity to practice their new skills. The course content is based on an internationally recognized award and participants will be given a certificate of competency endorsed by the Wilderness Centre. Never lose your way again after completing this 2 day basic navigation course. Ideal for people with a keen interest in jungle trekking, adventure racing, orienteering or those who just want to learn some basic navigational techniques. Using a combination of theory and practical activities, experienced instructors will give you the knowledge and skills required to navigate in remote areas using both map and compass. After completing this course you should be able to read a topographic map, identify land features, give accurate grid references, create a route plan, orientate a map, take a compass bearing, walk on a bearing and use a resection to pin point your exact location. If your line of work involves taking groups out into the outdoors then an extra day can be added onto the course which focuses on the skills needed to guide groups including appropriate planning, group management, briefings, hazard awareness, risk management and emergency response procedures. This 2 day course introduces more advanced navigational techniques while allowing participants to once again practice and refresh their basic navigation skills. The overnight aspect of the program means that participants will be educated in camp craft including setting up shelters, cooking as well as personal and camp site management. Off track navigation will be a primary focus for the duration of this course as well as navigating using a GPS. It is advised that participants have completed the basic navigation course as a prerequisite. This 2 day course is designed for those people wishing to learn basic rope skills. Whether heading out with friends for a climbing trip or participating in an adventure race it is vital that you have an adequate level of knowledge to keep yourself safe. The course covers all the basics you need to know and more. Experienced professional instructors focus on personal safety and sessions include: harness and helmet use, care of equipment, knots, carabineers, belay technique and abseil technique.